“A thrilling interspecific cross bred at Ashwood. Beautiful clusters of frosted pink flowers, paler within, delicately frilled and veined. The foliage is akin to that of one of its parents, H. niger. This lovely hybrid requires a sunny position in a fertile, well-drained soil. 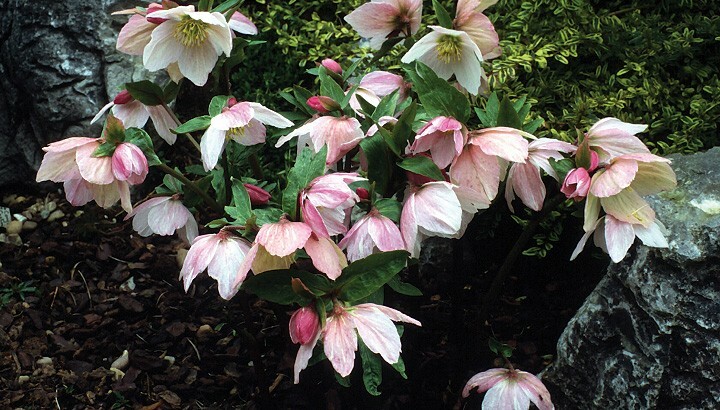 A ‘must-have’ plant for the hellebore enthusiast and keen plants person. Orders are welcome but please be patient as Ashwood Nurseries only have a limited stock available”.